Self Supporting Roof System which is available in a wide range of sizes and can be delivered quickly throughout the UK. Engineered and designed to be high quality and easy to install, the system contains all the elements required to install a complete self supporting roof which is lean to in design. 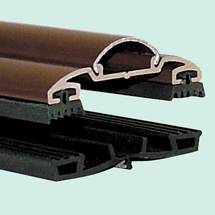 Available in Brown and White as standard the self supporting glazing bars accommodate 16mm, 25mm, 32mm and 35mm Multiwall Polycarbonate Sheets or Glass units. The system consists of a choice of glazing bars, wall plates & eaves beams. Dedicated main bars and end bars are available as well as a range of complimentary accessories to complete your project. 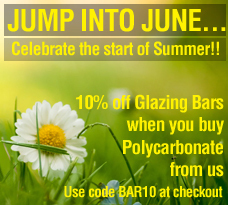 Spring Saver - The Glazing Shop is offering customers a 10% discount off your glazing bars when you purchase your polycarbonate from us, simply use the discount code BAR10 at the checkout. With a flexibility of use and quick & easy installation, the Self Support Roof System is the Professionals’ choice. This Lean To Roof System is suitable for a wide variety of applications including replacement roofing, conservatories, canopies and carports. * Please use our How to Build a Self Support Roof Guide to work out the projection that the bars can support across a range of centres. Please note our self-supported roofing systems are not cantilever in design and therefore the bars still require a frontal framework for support. To view prices or to buy online, please select from the options below. The Self-support roof system from the Glazing Shop is a complete system giving you everything you need to complete your project. On this information sheet we detail the components needed for your roof and more importantly the spans and centres required to construct it safely. This is crucial, as unlike with a timber supported roof, all of the support needed is from the system itself. What parts do I need for a Self-Support Roof? The following parts are all that is needed for your roof. Self-support End bars - again no rafters required. Same spanning rules as the main bars. They have a purpose made insert for the left and right ends of your roof to cloak them off neatly. The self-support wall plate screws securely to your back wall and has a PVC flashing and underclad for a neat and water tight finish. 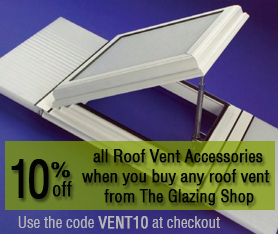 At the Glazing shop we have two eaves beams on offer for the front edge of your roof. 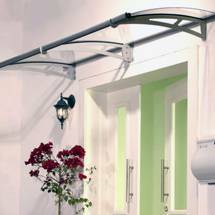 The self-support system eaves beam is the one you would choose for a conservatory or any roof that would have continuous support under the eaves beam e.g. the eaves beam in a conservatory would sit on top of the windows. It cannot self-span without this support under it. 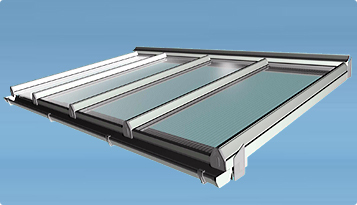 It is suitable for glass or polycarbonate roofs. 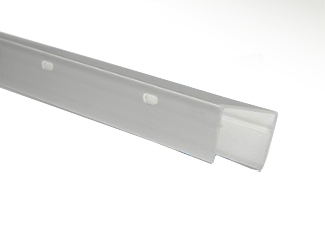 The aluminium eaves beam can be used with a polycarbonate roofed canopy. This would be supported by legs (not continuously) and can span up to 2.7m between the legs of the canopy with a projection up to 4m. This eaves beam has not been tested for glass which is obviously much heavier. 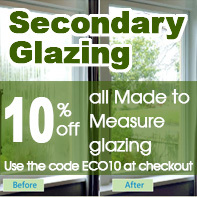 Glazing: The system is suitable for 16mm, 25mm, 32mm and 35mm Multiwall polycarbonate sheets or for 24mm glass units. Sheet closures are needed to seal the ends of your polycarbonate sheets if glazing your roof with this material. They help keep moisture, dust and insects from getting inside the flutes of the sheets and neatly cloak them off at the lower edges. The professional sheet closure also has drainage holes and a co-extruded lip for a tighter seal to the sheet. When building a Self-support roof for a canopy or conservatory you need to consider that the strength needed in the glazing bars cannot rely upon wooden rafters. This makes it crucial that the distances between your glazing bars (centres) are within the guidelines given for that roof system. 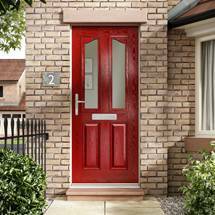 You also need to ensure that the widths of your polycarbonate does not exceed the maximum recommended widths for the thickness you are planning to use. This will make sure that your roof will cope with any wind or snow loadings given for that product. Also consider the eaves beam you wish to use and the spans it can achieve. If you bear these three things in mind you will have a roof that will be easy to install and will last for years. As you can see on chart below, the recommended centres are different if you are using these bars for glazing a polycarbonate roof or if you are using glass. You simply choose either polycarbonate or glass as shown on the chart and follow the graph to see how wide apart your glazing bars can be set e.g. 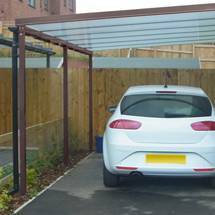 If you are making a polycarbonate roof with a 4m projection, the maximum space between your bars is 500mm. Alternatively If you want just a 3m projection your centres can be as wide as 1000mm provided your polycarbonate is thick enough. For glass you follow the same principles and as you can see you could not have a 4m projection in glass, the maximum at 500mm centres would be around 3.3m as glass is heavier and deflects more. As you can see here you could glaze your 3m projection roof with 25mm and upwards of polycarbonate but 16mm would be restricted to 900mm centres. At the Glazing shop we aim to provide all the information you need to make informed decisions about the parts of your self-support roof. If however, you are still asking yourself how do I build a self-support roof? Or how wide can the centres be between my glazing bars? 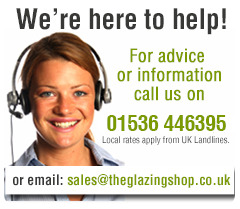 Or any other self-support roof building questions please call us at The Glazing Shop on 01536 446395 and we will be very happy to help.